POM is a free tool and by far the easiest way to pay and archive both paper and digital invoices. There are no card readers involved, simply ‘scan’ your paper invoice with your camera. You can receive digital invoices directly in POM. 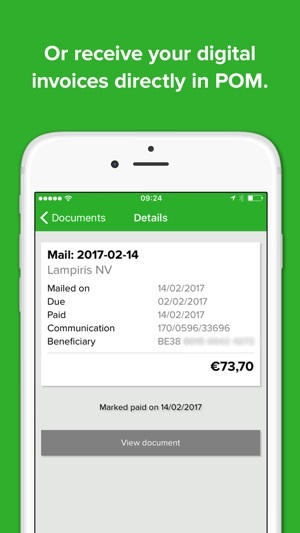 PDF invoices can also be forwarded or uploaded to the app. Safe and secure payments only take a couple of clicks. POM will then automatically store your invoices in your own cloud archive. Ideal for saving time and preventing reminder charges, both privately and for your business. Do you receive paper invoices in your letterbox as well as in your email inbox? Thanks to POM you can now process them all with just one handy app. 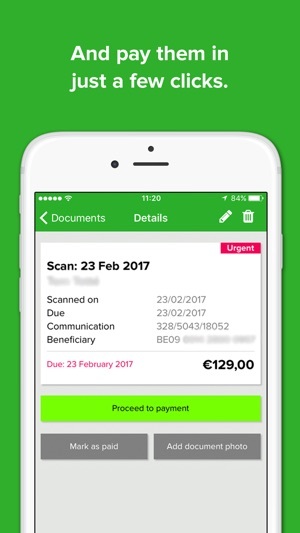 Simply take a picture of your paper invoice (with or without payment slip), or email or upload any PDF invoice directly to POM. POM will immediately recognise all details and save you the grief and time of entering these using a card reader. Payment is just a couple of clicks away. 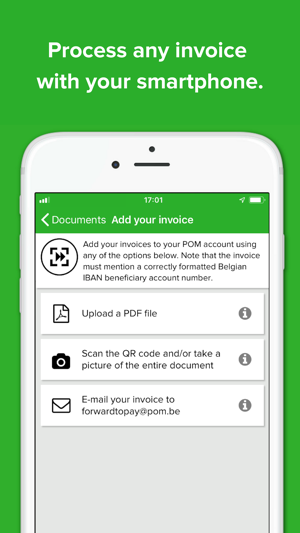 You can even opt to have digital invoices from our partners sent directly to POM. With POM you can see in one simple overview which invoices remain outstanding and which are still to be processed. Postpone a payment? No problem, POM will warn you when it’s time to pay. This prevents you missing payments and incurring unpleasant reminder charges. No idea what to do with those stacks of paid invoices? After your invoices have been processed, POM automatically archives them, either by email or in your Dropbox or Google Drive. Your invoices will be archived in POM for two years. The search function makes it easy to retrieve any invoice. When you use POM for the first time, we will ask you to scan the rear of your identity card. This is to ensure that POM delivers the right invoice to the correct person. 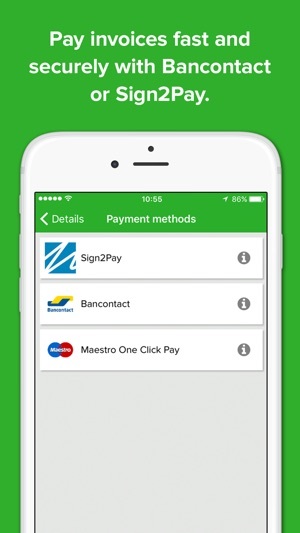 POM is also connected to all Belgian banks via Bancontact, Maestro and Sign2Pay. These banks guarantee the security of your payments. POM is a 100% Belgian app. POM stands for Peace of Mind. POM is free to download and use. The service is paid for by the suppliers who wish to send their invoices and any possible messages straight to POM. We guarantee your details will never be sold to third parties. 1. Download POM for free. 2. Your one-off registration is simply completed using the rear of your identity card. 3. Ready! From now on you can securely process, pay and manage your invoices. 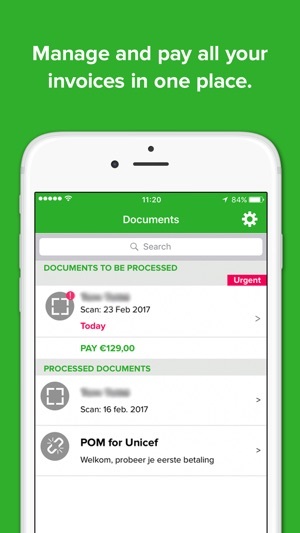 >>> Download POM now, save time, stop missing payments and prevent reminders! Enfin une app utile et qui a du mettre du temps à être en place à mon avis pour avoir l’aval de banques ..
J’adore et vais partager cette app !!! Voorwaar een verschil van dag en nacht. Nu is het alsof elk roze strookje naar me lacht. kijk ik er niet meer naar om!